Through the 1970’s and 80’s, Bowie reportedly struggled financially, even nearing bankruptcy. He hints at his financial difficulties, again through the lyrics of Lazurus, singing, “By the time I got to New York … I was living like a king … Then I used up all my money.” Bowie married his second wife, Iman, in 1992 and moved to New York just afterwards. A few years after that, he took control of his financial legacy through a move now considered to be revolutionary. With the help of investment banker David Pullman, Bowie sold a stake in his catalogue of music. 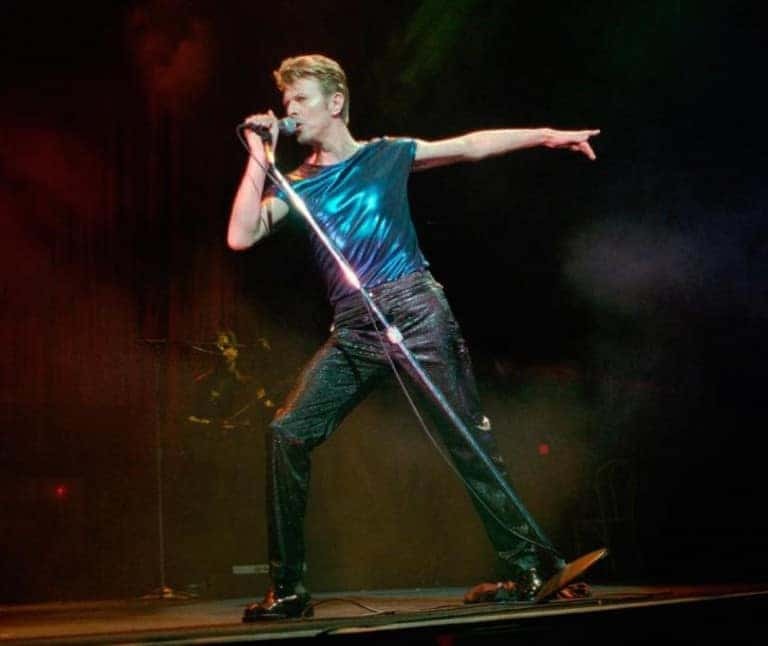 Instead of outright selling his songwriting, performance, and licensing rights to his many successful songs, in 1997 Pullman helped Bowie create “Bowie Bonds.” These allowed Bowie to sell – for $55 million – a 10-year investment, which operated like an annuity, providing a fixed-rate of return of 7.9%. The payouts where secured by all of his royalties and copyrights from the music. Prudential Insurance Co. of America purchased the Bowie Bonds and was paid off in full during the 10-year time frame. This is despite the change in the music industry brought about by Napster and similar internet-based music distribution, which dramatically reduced royalties available to song writers and performers. Pullman was recently interviewed about the financial creativeness that allowed Bowie to achieve security for the rest of his life. Pullman said Bowie did the arrangement, not to protect himself, but for his family, including his wife Iman, their daughter, Alexandria, who is now 15, and Bowie’s son from his first marriage, film producer Duncan Jones. Pullman said that Bowie was interested in estate planning at a young age and wanted to make sure that his assets passed onto his family. He did the Bowie Bonds transaction both for tax savings and so that his estate would benefit from his music catalogue. According to reports, Iman will likely receive the lion’s share of Bowie’s financial empire, which is estimated to be in the neighborhood of $200 million, before factoring in the expected spike in sales that will continue now that Bowie has died. David Bowie’s two children will each also receive substantial bequests. At this time, the details of David Bowie’s estate plan have not been made public. Given the reports about Bowie’s advanced planning and financial foresight, it is likely that he used one or more revocable or irrevocable trusts. If so, not only could Bowie have maximized the value of assets passing onto his heirs in the most tax-efficient manner permitted by law, but also his assets could pass privately, without the public scrutiny that goes along with probate court. In other words, the public may never know the specifics of how Bowie’s assets will be distributed. Too many musicians fail to do proper estate planning, often relying only on a will, which becomes a public document once it is filed with the probate court after death. Or even worse, many have no estate planning at all. For example, the Celebrity Legacies documentary series on Reelz explores the estates and legacies of various celebrities, and it is shocking how many musicians featured on the show have either failed to do any estate planning, or relied on woefully inadequate planning. For example, the heirs of John Lennon, Tupac Shakur, Jim Morrison, and Kurt Cobain all went through messy estate battles that could have been prevented if those music legends had used the same foresight as David Bowie apparently did. David Bowie’s well-planned estate should serve as a lesson for everyone else. Follow his lead and plan for your loved ones at a young age; don’t wait until it is too late.